SPYSHOTS: Nissan Grand Livina facelift caught undisguised! Home » Local News » SPYSHOTS: Nissan Grand Livina facelift undisguised! SPYSHOTS: Nissan Grand Livina facelift undisguised! Yesterday, we showed you spyshots of the facelifted Nissan Livina X-Gear undergoing testing in Malaysia. 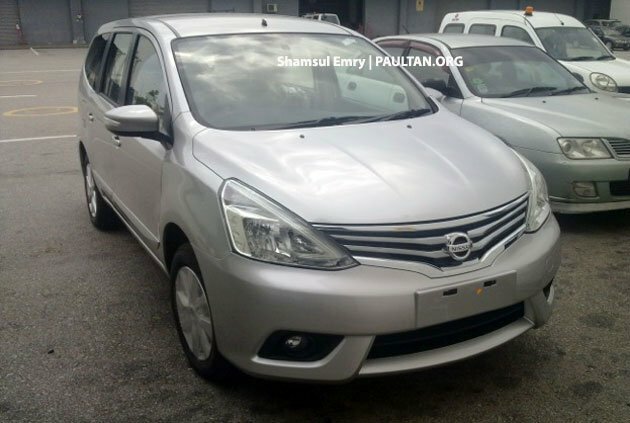 Today, we have spy pics of the Nissan Grand Livina facelift without any disguise, snapped by reader Shamsul Emry at the KLIA cargo area – thanks mate! This is the rear end the taped-up purple X-Gear was trying to hide – the facelifted Livina range (five-seater X-Gear, seven-seater Grand Livina) features longer tail lamps that eat into the tailgate, as seen in the initial set of leaked pics from China. Compared to yesterday’s spypics, we can now clearly see how the refreshed Grand Livina will look like, without the SUV-style body cladding the X-Gear wears. The tailgate Nissan emblem sits on metal here, not a raised plastic base like on the X-Gear. Shamsul’s handiwork also shows us the facelifted Nissan Livina range’s new face. Compared to the current Livina, the headlamps are now in a sharper triangular shape, while the chrome grille is in a sweeping V-shape with a flat base. Once again, it’s similar to what we’ve seen from the Chinese leaked pics. This silver unit is most likely a foreign-made unit arriving for local testing or other internal purposes, and not a product of Tan Chong’s Serendah plant. We’re speculating a year-end debut for the locally-assembled facelifted Grand Livina/Livina X-Gear. Untunglah bagi mereke yang telah beli generasi satu, with murano-like grill. I can design better than this! Nissan in Malaysia got no more RV. Nissan caters to the older generation and all the old granpas are dying. Younger crown only want Toyota or Honda. You buy Nissan, your RV will drop so fast, you don’t know what hit you! Better looking than the earlier ones but facelift is just we get nowadays! back looks like angry birds? I see keyless entry button on the boot lid. Not bad. Hopefully it will be in our CKD model too. New Forte rear lights.. nearly. I’ve seen many school-run mums running around in grand-lavinas nowadays. They like the fact that it’s quiet, simple, easy going, sedan-like driving attitude of the grand lavina while able to sit 6. So basically the statement nobody cares is wrong, it just Dose’t attract the petrol head like me, in fact it’s more if an anti-petrol head car. But to be honest, I like tha current grand-lavina, rather feminine and motherly look, this one is waaay to serious looking. Wonder will all the house-wife love it? OMG…Ugly like hell. MPV with sedan style front lamp and the rear lamp. weird lah…Still prefer the old 1. Ehh…Am I the only one see the back look like the face of Buttercup from Powerpuff Girls?? Pricing wise must be disappointed…. any kind soul could share the interior? is it same as current version? what an ugly car, seriously a proton Exora Bold is far more prettier and nicer to look at. this looks like an abortion of a car. Looks like facelifted avanva / innova. please, avanza is far more beautiful than this junk. it looks good, gonna get this for my wife in Q3 or Q4 this year. New model is supposed to be improvement. This car is ancient…what facelift. A car co that is not trying. Well, I find the rear end of this facelift rather dull or unattractive. Current one looked nicer and more elegant. Front end is not bad thou. it’s cheap, seat 7, easy to drive and it’s not korean nor malaysian. good for those who on budget but need to seat 7 people, not really keen to drive but rather force to drive, doesn’t want to buy local nor rather be seen in korean car.. The 3rd row is meant for kids only. Not enough space for adult legs. U know wat I mean. Anyway the front loos so Nissan so no fault there but the rear design looks so China inspired! If they can maintain the price and intro new goodies like keyless entry and curtain airbags that would be awesone. As a parent with 3 kids, this is the cheapest entry for japanese mid MPV. In future, most petrolhead will by mid size MPV too when they have more than 2 kids. Beauty is subjective? Don’t just talk craps.. You have money to buy or not? If not, shut the hell up. Looks is SUBJECTIVE. I like it. Its looks more masculine than before. You have problem with it? Design your own cars then. It does not look any better undisguised. Nissan strength is their after-sales service. I don’t think this mpv is better than Kia Carens 2013. Sweet mother of Japanese ugliness ! Wait this Korean before you decided for an MPV. before my mentality is same like yours but after using exora for 3 years i add on money just to release my previous bulky ,heavy ,lazy on uphill exora and exchange it to grand livina & the result is very satisfying no wonder nissan is the no.1 car in japan i should listen to my friend earlier before buying my crappy exora it causes me lots of money just to release it..drove nissan then you will know peace!!! 1st time saw I thought this car can go on water like boat! fugly. In fact by looking at it, I think I should get one. The tail lights looks great and trendy. I will choose X-gear over Vios TRD, simply because X-gear wins in terms of ook. Though both are outdated in technology, but I will immediately save 20k when I own it, and this equals 3-4 years petrol consumption. Many people praise for its decent handling, out of their expectation, many thought with this price tag, handling had to forgo and give way to better appearance. Looks and designs can be very subjective, but leads down to the reliability of the car. The reliability of Nissan cars are amazing. Hey, it’s true Wong. Don’t compromise reliability for great designs (which I feel the Nissan Livina X-Gear still looks amazing). it’s not a new nodel launch, its a facelift. I feel it caters for young and old. The facelift looks great. Great job!! exterior nampak elegan dan maskulin. Sesuai untuk semua golongan umur. Harga memeng berpatutan dengan teknologi dan design. berbaloi untuk memebelinya. Ruangan dalaman kereta luas (legroom). I feel the Grand Livina is looking more competitive in market now. with its distinctive exterior and multi winning awards. This is a great car. I like nissan’s engine. Their aluminium engine rev easily. All new models are good. Salesman oso good. cause nissan is the super hero car brand in japan not toyota not honda not mitsubishi its NISSAN !! !who made R30,31,32,33,34 and the latest godzilla R35 so to those people who hates nissan do your homework dont just simply talk cause lots of people is laughing at you for being ignorant as if you are expert hahahaha…NISMO,IMPUL,CALSONIC,RENAULT,HITACHI,DATSUN these might help to those people that has lack of infomation research !!! research!!! research!!! I like the design of this car. Great!! Nissan lines quite feminine before.. Even the names are feminine.. Livina, almera, teana.. At least now we have more masculine design. The new livina will be in my radar. Almera also in my radar. The design of Grand Livina looks great!!! Nice one..!! The new Grand Livina design is better than the older!!! Can’t wait for the arrival of Grand Livina facelift. Looks Great! exterior grand livina elegant la..
Nissan new car… thumps up!! grand livina is a nice car. nice looks and nice to drive as well. I think the current design is better than this one. Seriously can’t make it..Look what happen to the 2nd gen Toyota Wish sales. in japan nissan is the no.1 car brand and the most reliable car so to those people who gave bad comment and comparing EXORA common do your homework and wait as far as i know proton is proton a trial and error brand not recognize as stable manufacturer so shut up!!! i am a nissan fan but seriously, i prefer the current design just came from indonesia and saw it…the only thing that made it interesting is they install x-tronic cvvt on the transmission means more power, more smoother and more speed and more responsive transmission.. the engine still MR 16DE and MR18DE which features renault,calsonic and hitachi on some parts.. Wait for impul version. More refresh than older version. Previous Post: McLaren P1 – pictures of full production model leaked!